Finally!!! The snow is melting and the sun is shining. Spent time stitching and watching my son work on his thesis. Peaceful. My days are divided between quilting and stitching. My quilt blocks get the morning hours and my afternoons are saved for stitching. But no more stressful thoughts...I'm snapping the rubber band on my wrist...so in the spirit of beauty and peace, I'm showing you the following. I never considered my geraniums as house plants until last year. Usually I leave them outside and just purchase new ones in the spring. But no more! 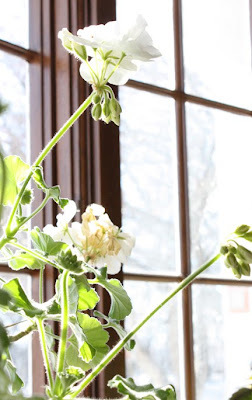 This is the second year I have brought in my white geranium to overwinter in the house. It sits in my south bay window. The fresh white bloom and spring green leaves cheer me up. It's amazing how they bloom all winter long. Just clip the spent blooms and continue on their merry way. Thank all of your for your thoughts and advice. Barb and I really appreciate you taking the time to let us know your ideas. We can use them all! Hope it's warm and sunny where you are! Ohhh, Alma.....I love those Belle Soie colors. Is that a hint of things to come or is it something I missed? 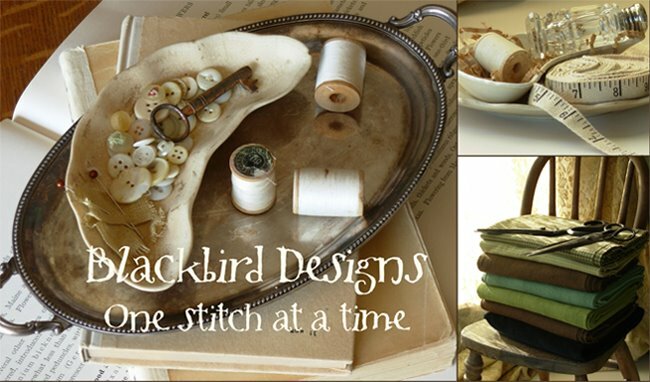 Love the looks of that cross stitch you are working on! When will that be available? No pressure... LOL! Thanks for the tip on the geraniums! Something new for me to try next year... definitely something beautiful to look at to keep the mind off of the cold and snow! That design you're working on looks very pretty! Can't wait to find out what it is. 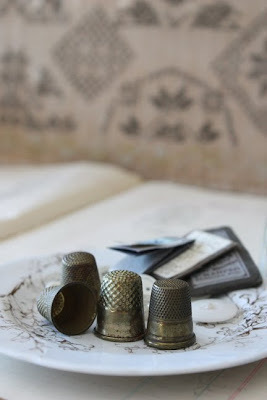 Great pictures, though that last one of the thimbles really spoke to me! I love the antique look to them. Something about it just says "home". Have a great day. Just love your geranium!! I also purchase new ones every year..... So thanks for the idea! I'm going to try it as well! Hope the peace and quiet endures a little while longer, so you have all the time you need to finish your projects! Glad to hear you have sunny days - we had a heat wave too of 43 - yippeee!!! Loved it!! Does it count if you have some silk geraniums?? These are really pretty good ones. Do you keep your threads on the cards like that or wind them - what are your pros and cons on that?? I, also, just loved that last picture of the thimbles, and may have to recreate it. What a lovely cluster of buds you have amongst your blooms. I also have several Geraniums indoors. They no longer flower due to lack of sun, but their hearty green foliage and vines/spikes prevent me for banishing them. Ohhhhhh to have a sunny south facing wall of glass, would indeed be nice! Hasn't the warmer weather been wonderful? I was beginning to think we'd been moved to the North Pole. I have roses in my basement that look a bit sad now but will have a jump start with new growth when the weather allows us to put pots outside again. I think you are teasing us with that first picture - I can't wait to find out what it is! I am doing more stitching again, it is a nice break from my other projects and I find it relaxing. Love your white geranium!! Almost as white as the snow overhere hihi! Am working on the August stockings, been a bit behind, looking forward to things to come! Take care and have a nice day! Oh geraniums are so lovely!! and yep, its definately warm here down in Australia.. we are having one hot summer!!! Looks like a very beautiful border on the piece you are stitching! Your Geranium photo is lovely and so peaceful and so is the photo of the thimbles. That snippet a sampler is so yummy! Look forward to seeing the whole thing! Google translator Oh thanks, thanks to you I can speak to Alma on how nice it is his blog and ask her where I can buy cross stitch Blackbird in Spain??? I love your geraniums, in Spain is a very dear silver, especially in Andalusia and Extremadura, where I am. 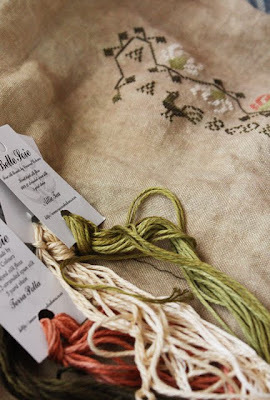 The colors in that stitching are gorgeous! Can't wait until we can see more! I'm confused - are you or not going to continue Loose Feathers after the last one for 2009 appears. I keep reading conflicts on the net. Yes you are but a different format and no this is the end. Please clue me in as I am very confused and have loved the LF series all these years. Loose feathers is going to change. I think it needs an update...we just aren't sure what to do with it just yet. We will know soon and I will let you know. Your geranium is beautiful. I did not know you could bring them in for winter blooms. I will have to try that next year. Love the sneak peek, gorgeous colors. I may have to try bringing my geraniums in too. I have a very sunny window that faces the mountains, they'd be gorgoeus there.